When Elder James J. Hamula was called to the First Quorum of the Seventy, it wasn't the first time he had been called to full-time Church service. Of course, he had served as a missionary as a young man and as President of the Washington, D.C. Mission from 1994 to 1997. But even as a young bishop in Arizona he had given a level of service that gives new meaning to the phrase, "full-time." He explained in an interview with the Church News, shortly after his call to be a bishop, his growing stake, which only had one meeting house, planned to build three more. In that era, he said, members were expected to donate money for their new buildings. His stake president realized that would be asking the members for a lot of money and instead worked out a sub-contracting arrangement with the general contractor so that members' labor could be their contribution. Elder Hamula said he asked the stake president, "When are we going to do that?" He and the other members had families, jobs and Church callings already demanding their time. Elder Hamula recalled that the stake president answered with a question: "What are you doing at 3 o'clock in the morning?" "So for two years, much of my work as a bishop was spent getting the priesthood organized to go to the Church building sites at 3 in the morning. We would work from 3 to 6." After about a year, he said some members of the ward council decided it would be better to pay the money. "I learned a very important lesson at that moment: I had consecrated to give my time and my all to the work of the Church; that was more important than writing a check. I also learned at that moment which way I should be facing as a leader. It was my job to face the people and tell them what the Lord wanted, not to face the other way, with the people behind me, telling the leaders ahead of me what the people wanted." Those principles were a valuable blessing from that time as Elder Hamula successively served as a stake president, mission president and Area Seventy. Another blessing Elder Hamula and his wife, Joyce, were grateful for was the firm faith of their forebears. His Hungarian grandparents immigrated to the United States in the early 20th century seeking greater economic and religious freedom, Elder Hamula said. His grandfather, Ambrose Hamula, was actually sold into servitude in Hungary at age 12. After a time chained to a workbench, he escaped and made his way to America. Elder Hamula's father, Joseph, was born and raised in a Hungarian-speaking suburb of Cleveland, Ohio. After serving in the military during the Korean Conflict and ending up in Southern California, he found the Church there. President Howard W. Hunter was his stake president and called him on a mission. Elder Hamula said his father's serving in the Swiss-Austrian Mission grounded him in the gospel. Sister Hamula's parents, Henry and DeAnne Anderson, were converted when she was a young girl. Her mother had health problems and was confined to a wheelchair. A year later, the family was sealed in the temple. Elder Hamula told the story of his wife's mother being taken into the temple on that day in her wheelchair, but experiencing a healing while there that enabled her to walk out. Sister Hamula said that the temple experience that day "was the first time I remember seeing my mother walk." When Sister Hamula's father died a few years later, her mother was still struggling with her health and was told by doctors she would do better in a mountain or desert environment than in San Jose. Their bishop, Richard Hunter, set up a meeting for Sister Anderson with his father, Elder Howard W. Hunter, then a member of the Quorum of the Twelve, who had already impacted the life of Elder Hamula through his father. Elder Hunter counseled Sister Anderson to take her family and move to Arizona. "That's why Joyce was there by the time I got there," Elder Hamula said. While in law school at BYU, he had the opportunity to work as a law clerk in the Phoenix area one summer. "I had this impression that I was going to Arizona because that was where I would meet my wife," he said. He went to a dance at the institute adjacent to Arizona State University and met Joyce Anderson. The next day, they were in a Sunday School class together. Elder Hamula said he decided he would try to get her phone number. After Church, he was on his way to ask her when a friend interrupted his chance. "I told him, 'You just caused me to lose a date,"' Elder Hamula said. The friend asked why. "I told him, and he said, 'I know who she is and here is her phone number.' I called her the next day." A year later they were married. The marriage was blessed with six children: Jerilyn, Jordan, Jennifer, Julie, Jared, and Joseph. Elder Hamula's chosen profession was law and after finishing law school at Brigham Young University, they returned to live in Arizona where he got a job at a law firm. From thence, it has been a succession of callings and work, each bringing greater responsibility. 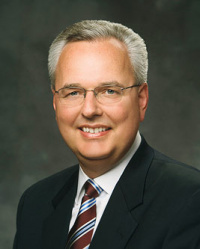 He became a shareholder in his law firm and served as bishop, stake president, mission president, and Area Seventy before being called to the First Quorum of the Seventy on April 5, 2008. On Tuesday, August 8, 2017, James J. Hamula was released as a General Authority Seventy of The Church of Jesus Christ of Latter-day Saints, following Church disciplinary action by the First Presidency and Quorum of the Twelve Apostles. The disciplinary action also included his excommunication from the Church. This page was last edited on 11 August 2017, at 17:27.